According to the statistics in the spring of 2014, more than 50% of the radio stations in Romania, which use licensed professional software applications for the management of their radio programs, use the Q products. 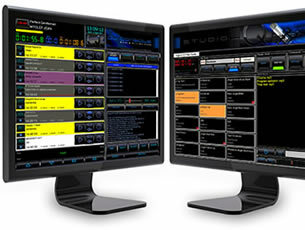 The Studio Q application is the core element of the radio automation software offered by our company, as it includes all the modules and functions needed for the creation and broadcasting of a complex radio program. It has a module designed for broadcasting (playout), loading tracks and other types of audio recordings into the database, automatic playlist configuration, primary advertising programming, reporting/monitoring or sound settings and control – all part of this basic pillar of the QSound SOFT solution. The users of the Studio Q application enjoy the safety and stability of a broadcasting software solution employed by radio stations throughout Romania and Eastern Europe for over 15 years, with features developed as required by the professionals of more than 250 radio stations. We use Windows or state-of-the-art Android technologies, providing the classic radio with interactive functions especially created for the mobile devices ever-present in the pockets of the listeners. Actually, we offer a new radio concept in which the radio broadcaster and his listener are permanently connected by a chain of consistent and natively interfaced applications. Additional ventilation, housings for the broadcasting systems We do not recommend the use of the sound or video cards available on the motherboard. 13 februarie 2015 – procedura de mapare songuri din fişier SongDatabase.csv pe un OnAirPrograms În condiţiile în care pentru mai multe linii de radio (programe de radio independente) se foloseşte o singură bază de date, s-a implementat facilitatea de import automat al raportului de bază de date SongDatabase.csv generat de BSQ Client pe un OnAirProgram selectat. În acest fel, bazele de date existente deja la clienţi pot fi remapate pe ArhivaMuzicală centrală, utilizând această facilitate. 5 februarie 2015 – Modificare filtre de selecţie MassMove, pentru a putea exporta fişiere asociate cu o anumită linie de radio În condiţiile în care pentru mai multe linii de radio (programe de radio independente) se foloseşte o singură bază de date, am implementat în MassMove posibilitatea de filtrare a înregistrărilor după programele audio la care au fost asociate. Odată filtrarea de OnAirProgram activă, operaţiunile de export în containere pot fi făcute combinate cu celelalte filtre. 30 ianuarie 2015 – Extindere setare paletă de jingles la 255 de înregistrări. Limita de 60 de fişiere pentru sistemul de calcul soluţie de umplere a fost extinsă la 255. 7 ianuarie 2015 – Randomize Music Database – S-a implementat o opţiune nouă de reordonare a pieselor din baza de date, astfel încât ordinea de redare să fie resetată într-un mod aleatoriu. Facilitatea este importantă în momentul în care s-au încărcat consecutiv multe piese ale aceluiaşi artist, iar softul nu poate stabili o ordine de redare pe baza timpului de editare în baza de date. De asemenea, este utilă în cazul importului de containere în care piesele au fost importate în ordine alfabetică. 6 septembrie 2014 – Încărcare imagini CLOUD din Edit Record În Edit Record/AllOthers s-a creat un nou tabsheet pentru editarea datelor spotului, pentru a fi trimisă poza în StudioQCloud. Când este în program DE SATELIT/NAŢIONAL (sau de reţea) conform setării CU BIFA [x] din harta de sincronizare: Report&Settings > Technical Department > NCP Commands > NCPControl MAP softul funcţionează în regim de control după semnalele de satelit. 29 martie 2014 – Implementare proceduri în Playlist Editor de ImportAllDayPlaylist şi EXPORTAllDayPlaylist Implementarea unei comenzi de export al playlist-ului încărcat pentru întreaga zi, pe o anumită linie de radio (program) într-un fişier unic, utilizând în export codurile OnAirMusicDatabase sau SUID/Pinf. Aceste coduri se transmit de la calculatorul master (cap de reţea) la calculatoarele care importă baza de date muzicală şi alte tipuri de fişiere audio, fapt pentru care asigură identificatori unici pentru fişierele exportate în containere. June 5, 2014 – The algorithm used for the filling of the advertising blocks of a radio network’s local stations has been modified. The new algorithm uniformly rotates the Netsync palette as time history, relying only on the date/time of the last broadcast and the calculation of the advertising block length. May 8, 2014 – Development of the message interface in the broadcasting console for the Interactive.net application. With the new interface the DJ/promoter communicates TEXT directly from the DJ Console to the listeners who have installed the mobile application of the radio station. April 11, 2014 – We have improved the recognition of sound cards under Windows 7 and now there is an extensive range of sound cards that can be used. March 2, 2014 – Procedures have been implemented in the Report&Settings > Programs Department > Playlist Editor for the Import/Export AllDayPlaylist to be used in the synchronization of playlists with external software or for their transmission from the network head to the local stations. The import-export commands can be automatically generated via the BSQ Client or Server applications. February 21, 2014 – The DJ Console module sends information about the artist, song name and the duration of the advertising block to the mobile application (Android – v 0.2.2). January 27, 2014 – We solved a few bugs related to the different mixing of tracks saved with Playlist Manager vs. Playlist Generator (thanks to Radio Impuls Cluj); the reporting module for the import of advertising grids has been revised; the import of the musical genre palette from the Programs Department > Genre&Categories Editor has been redesigned (thanks to Radio Zu). November 14, 2013 – We have introduced additional logs to the initialization of the database and the ADO connection testing. 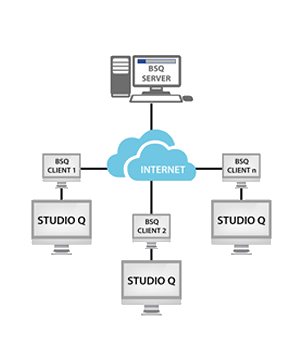 In addition to the Studio Q basic software, we have developed a number of specialized sub-modules that work natively interfaced with the Studio Q basic application. The News module performs the complete management of the news processed by the reporters and editors of the radio station, providing functions for news editing, assignment of audio inserts, their grouping in newsletters and the easy management of their playback in the broadcast. The NEWS module enables the archiving of information, as well as searching on the basis of multiple criteria, implementing a quantitative/qualitative evaluation system of the news entered by the people of the news department through an intuitive reporting interface. In order to ensure a non-stop (24-hour) broadcast, regardless of the technical problems that may occur at a non-stop broadcasting radio station, we have created a broadcast mirroring system. Thus, the audio files and the data from the databases are automatically copied to a second broadcasting system, which is always prepared to take over the broadcasting if a hardware component in the main system fails. This way, by implementing back-up functions in the Studio Q system, there is no possibility for the interruption of the broadcast due to software or hardware issues. Studio ECHOne is a module designed for the monitoring of your radio station’s broadcasting, its main purpose being the detection of breaks in the broadcast or of software issues in the play-out system. Thus, the audio signal received from the ether through a tuner is picked up into a sound card and processed by a Silence Detector. If this signal falls under a set limit, SMS messages will be sent via a GSM modem or e-mail to the technical department of the radio station. In case of radio networks, the timing signals sent via satellite and the operating mode of all applications of the StudioQ are monitored. The system has a preset primary problem-solving function for the known operational problems, taking automatic troubleshooting measures and only sending data to the technical department in case of failure. The BSQ system is designed for radio networks, as it has been developed for the complete management of local stations from a single location (CENTRAL station). It implements automatic transfer functions of audio files via the Internet, advertising grids, playlists, reports to/from the CENTRAL station and it has mechanisms for the loading of these files in the broadcasting software of local stations. The local software will receive signals for inserts via satellite or Internet, all operations from the local station being done automatically, without human intervention. Tehnical Specification Runs on a SERVER system, requiring hardware resources (disk space, RAM) depending on the number of local stations to be managed. CPU: Intel XEON X3430 @ 2.4 Ghz RAM: 8.00 GB OS: Windows 2008 Server Standard SP2 HDD: 500 GB LAN: Gigabyte Applications: FTP server: Cerberus, ServU, SQL Server 2008 Documentation BSQ SERVER – manual2014.pdf [5.2 Mb] 3,5 MbUpdate November 4, 2013 – The application is interfaced with StudioECHOne, automatically sending a warning e-mail to the Technical Department in case of order processing failures or server malfunctions. 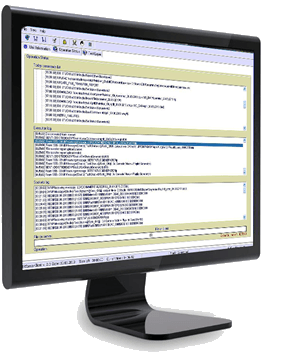 The BSQ Client module is a Client component of the BSQ Server module and it executes the management of the various software solutions installed on the local station. It contains a set of commands (on/off at a certain time, download/upload of files, upload of audio files, advertising grids, music playlist, creation of reports and specific commands) which are executed automatically by sending them to the Studio Q broadcasting software. Tehnical Specification Runs on the computer that ensures the broadcasting in the local station. The application requires a guaranteed Internet connection of minimum 512 Kbps. Documentation BSQ Client-manual2014.pdf [5.2 Mb]Update October 20, 2013 – Spot scanning vs. broadcasting function in the playlist The users of the BSQ module are provided with a new facility allowing them to check if the scheduled spots have actually been broadcasted according to the schedule. Procedure: The advertising grid is scanned and compared to the broadcasting report in the broadcasting software and a specific message is sent to EchONE in case of deviations. March 28, 2013 – Implementation of the “EmptyPalette” and “AddPalette” commands which enable the automatic change of the recordings in a pallet. The RDS Controller is an application that transmits the data from Studio Q to an RDS system (Radio Data System), to display text messages in real-time to the listeners who have radio devices endowed with the RDS option, by using information connected to the on-air recording from Studio software, the broadcasting or advertising messages. The SOUND LEVEL CONTROLLER (SLC) is an application for the predefined control of the output volume for WINDOWS compatible sound cards. The master volume of the sound card can be changed automatically by the SLC based on the settings in the user-defined time intervals, considering the following parameters: the minimum / maximum accepted sound level and 14 time intervals with different volume settings depending on the days of the week. The application is useful for setting the sound volume in locations where background noise during the day varies in a predictable way, so that sound compensation can be estimated and then adjusted with the SLC so that the signal / noise remain constant.